The Shadowmagic Trilogy is out in paperback NOW. All three of John Lenahan's novels in one volume! Looking for John Lenahan's comedian/magician site? Click here. Want to listen to Shadowmagic on itunes? Shadowmagic is a rip roaring fun fantasy adventure novel by John Lenahan very loosely based on Irish mythology where every chapter ends on the edge of a cliff (or at least a high curb.) Join Conor as he grapples with typical teenage problems like, how to deal with a father’s high expectations, how to survive in the world on your own and how to woo a beautiful girl - that wants you dead. 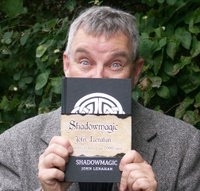 Shadowmagic - novel for the young at heart from 12 to 112.